Wigan have signed midfielder Olivier Kapo after agreeing a £3.5m fee with Birmingham City. The 27-year-old has clinched a three-year contract after undergoing a medical at the club on Tuesday. Wigan boss Steve Bruce signed the French international in a £3m deal from Juventus when he was at Birmingham. A delighted Bruce said: "He's one I really wanted to get on board. Olivier's a real fighter, but he has a touch of quality about him." He added: "He can play in a number of positions and having worked with him in the past, I know what a good addition to our squad he will be. "He has Premier League experience, which is important, and I'm confident he will do well here." Bruce has already gone back to his former club during the close season to sign winger Daniel De Ridder. 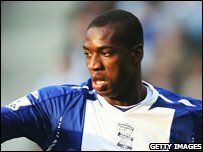 Kapo scored five goals in 26 appearances last season as Birmingham were relegated from the Premier League.